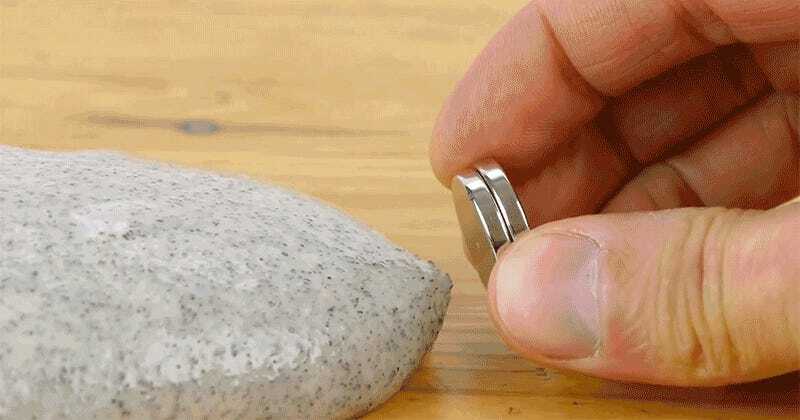 If you’re not sure the novelty of putty that reacts to magnets will hold your attention long enough to spend $15 on a whole can of it, Dave Hax shows you how to make your own on the cheap using just Elmer’s white glue, some Borax (sodium borate) powder, and iron filings. The results work almost exactly as the putty you can buy in novelty shops, seemingly coming alive in the presence of a strong magnetic field. The only drawback is that your homemade magnetic slime won’t store very well, as the iron filings will slowly start to rust because of the water in the white glue leaving you with a nasty brown sludge. But by that point you’ll probably already be bored of it.